I would like some help in identifying a small ceramic figurine which I have recently recovered while clearing my mothers house after her death. 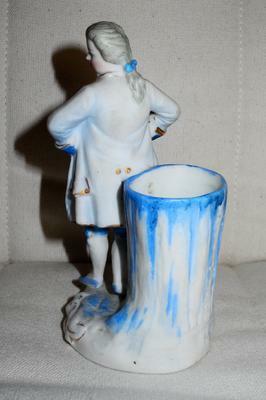 The figure is unglazed with blue and gold coloring, and has what looks like a “W” on the base, although I suppose this could also be an “M”. I have tried to identify the mark by searching the internet, but while there are several possible matches, nothing seems to be exactly right. The best match might date from the mid 1700’s, which is feasible for one reason given below, but not totally consistent with other information I have. I would like to know more about the figurines origin since I not only find it very beautiful, but knowing more about it would also add interesting knowledge to the family history. From my researches so far I can immediately rule out certain obvious candidates for the manufacturer. Since my grandmother lived all her life in England (UK) an initial assumption was that the manufacturer was also from the UK. 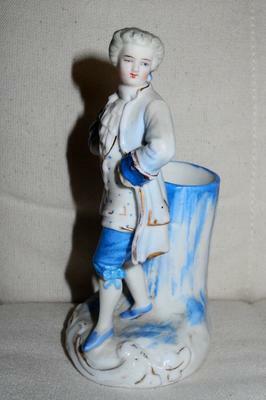 Assuming that the letter on the bottom of the figure is a “W”, this would point a total novice in ceramics like me to Wedgwood or Worcester as manufacturers. However it didn’t take long to eliminate these, since there is no match with known marks of these two companies. Now to the history of the piece and why I am interested in it. I was especially pleased to recover this figure as it brings back childhood memories of visiting my grandmother during my summer holidays, of days spent catching crabs on the beach, eating fresh figs straight off the tree in the garden, and chasing butterflies with my brother on the nearby chalk hills. I can remember seeing this figure in the 1950’s standing on my grandmothers mantle-piece. At that time it was one of a pair, the other piece being a lady with a flowing skirt, and the two figures used to stand at each end of the mantle-piece. Unfortunately the lady figure has now gone, presumably broken at some time. I must have been about eight years old at the time of these memories, so the remaining figure is now definitely over sixty years old! If the figures are older than about 1906 could they have been some sort of family heirloom? If I had an idea of the age of the figures this would help to clarify this point. Another possibly interesting point is that my mother claimed that the figures represented King George III of England (1760 to 1801), and his wife, Queen Charlotte. I don’t know why she thought this, but the style of the clothes would be about correct for that period. Incidentally, George III was the king that “lost” America for England! 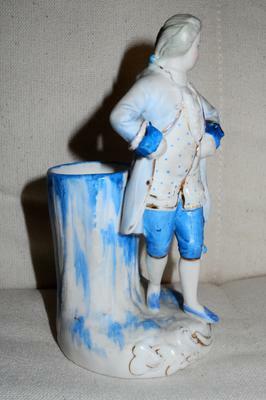 If my mothers belief is correct and this figure does indeed represent King George III, this would also suggest that the figure is older than 1906. A third point I would like to clarify is that my mother said that the figure was a candle holder. Looking at it more closely and at pictures of early candle holders on the internet, it seems to me that the holder is too large and totally unsuitable for holding candles. Even very early candle holders seem to have regular shaped holes and drip catchers, and I think it is more likely to have been intended for holding dried flowers, or maybe pens. This one got me going for sure. 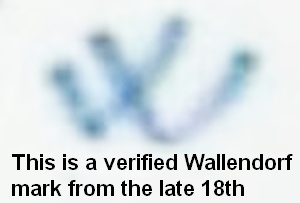 So, the W crossed over in the middle I immediately recognised as being of the type of mark that a German company called Wallendorf used (aka Wallendorf or Wallendorfer or Porzellanmanufaktur Hamann). It is a spill vase. A spill vase was used for keeping tapers on the mantlepiece (for lighting lamps and candles). So is this consistent with their output over the late 18th century? Yes, I think it might be (evidence in a minute). OR, is it a clever 1950s clever Japanese rip off? So Wallendorf were known to make this style of figurines, but the ones I have seen were glazed not bisque as these examples (they sell for up to around $1000 USD at the top end of expectations - for superb sought after examples). I think there are some similarites in style and finishing. So all in all interesting - a shame you don't still have the pair.